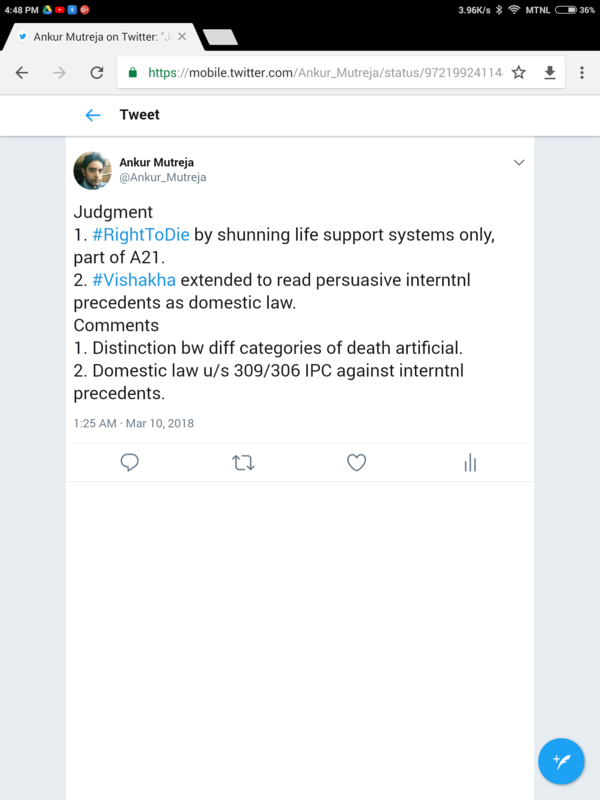 The Supreme Court of India in it’s recent judgement in Common Cause has included the right to dignified death by withholding/withdrawing medical treatment in case of terminal illness requiring prolonged treatment or subjection to life support systems with incurability or no hope of curability, as part of Article 21 of the Indian Constitution. The above exercise of choice to die is commonly known as passive euthanasia. Further, the Supreme Court has issued directions/guidelines for recognition and exercise of this right through advance consent or through the consent of the next friend/close family. The directions/guidelines have been issued u/a 142 of the Constitution r/w Vishakha judgment. In past when a similar judgment was rendered in Aruna Shaunbaug, I had criticized the judgment as illegal. I can undertake a similar exercise again thereby reaching a similar conclusion but am not interested in obfuscating the momentous question of ethical validity of euthanasia in legal niceties. I made a terse tweet yesterday commenting on the judgment. The same can be expanded to reach a conclusion similar to that I reached in Aruna Shaunbaug. I am reproducing the tweet below, but, as already stated, I have no interest in legally analysing this judgement. The momentous question is of course the ethical validity of passive euthanasia. I believe in manifestation of dignity through self-determination, not only in humans but also in animals, plants and even robots. I also believe privacy, as understood as a right to create and protect a zone of repose for making self-determining choices, as an essential ingredient of dignity and vice-versa. Passive euthanasia giving a choice to an individual to make a decision about non-continuation of life is certainly part of dignity and privacy both, but the important question is information available to the individual to make the choice. Is it possible for an individual to make a choice about withdrawing/withholding treatment without experiencing the terminal illness first-hand in his own unique circumstances. Can such a choice be made in advance through a “living will” just on the basis of academic knowledge of sufferings undergone by subjecting oneself to life support systems or prolonged treatments? Furthermore, is this academic knowledge sacrosanct, which can never change? Of course, not. So, it means one way or the other the advance consent of an individual would be subjected to the judgment of assumed guardians whether in the form of the State or the physicians or the next friends/guardians. In the present context, the Supreme Court has indeed not recognized the concept of “living will” and has made the advance consent of an individual subject to the judgment of the physicians, the executive through the collector concerned, the judiciary through the judicial magistrate concerned, and the guardian/close relative/next friend. In fact, it is such a cumbersome and long-winded procedure that the guardian/close relative/next friend would rather find it convenient to withdraw consent (unless of course he has some vested interest in the death of the individual). I don’t think there is any exercise of a choice to die in such a cumbersome procedure. If at all, there is only one instance when an individual would be able to exercise this right himself, and that would be when though terminally ill he would still be in a position to withdraw or confirm the consent at the time of the illness without any prejudice emanating from his psychological condition, ignorance, etc. My rationale for reaching the above conclusion is simple and straight forward. The very concept of an individual precludes the exercise of his right through another person, however close he or she may be. The State can definitely not substitute for an individual with respect to the exercise of his right to life when it has no power to grant or deny life post the Privacy judgment, wherein ADM Jabalpur has been overruled (it is the right time for the anti death penalty lobby to strike). It is unfortunate but true that the very precious right to life extending to right to die vide passive euthanasia is but non-executable except in one instance elaborated above. I need not argue with respect to a scenario where no advance consent has been formulated as prescribed in the judgment, for all that is stated above will apply with full force in case of substitution of an individual’s consent by that of the guardian/close family/next friend. The above situation has arisen because the Supreme Court has failed to understand the concept of death per se. Survival is a decision of a free conscious-mind, but extinction is forced by external factors. So, I don’t think there is a crystalized right of individuals to die as the decision to die is never made in a zone of repose. Of course, I have contradicted myself with respect to what I have stated above but only to a salutary effect. Passive euthanasia to avoid suffering also emanate from the inability of the society of physicians to ameliorate the suffering of individuals due to some unfortunate illnesses. However, the physicians can’t be punished for this inability by taking away their precious right to save lives. Yes, saving lives is not a duty but a right of the physicians u/a 21 of the constitution, which right has been taken away by this judgment through unfortunate misinterpretation of death. Be the first to comment on "Ethical Validity of Euthanasia Judgment"